Its official, Tableau 7.0 is live! Our development team has worked hard to bring you a new release that advances what you can do with Tableau. Whether you’re a business user who needs to get more from data faster, an IT professional seeking a self-service business intelligence platform, or an executive who simply wants to get answers, we've built 7.0 to deliver something for you. To start with, 7.0 includes a groundbreaking new Data Server will deliver easier access, sharing and management of data. Flexible, Shared Data: This multi-faceted feature allows anyone to publish an extract or database connection to Tableau Server- enabling anyone with permissions to connect to that data directly through Tableau. In addition to making data easier to access, this also makes it easier to manage and secure large data sets. New ways of seeing: The visual analytics toolbox will expand significantly with exciting new chart types like filled maps and area charts. In particular, an easy, intuitive way to create filled maps is something that people have been thirsting for. Analytical Firepower: Enhanced parameters, statistical features and mobile capabilities will significantly expand the ability to see and understand data. In addition to those brand new capabilities, Tableau 7.0 also makes many analytical tasks, like manipulating dates and excluding data easier. Enterprise Class: Tableau 7.0 includes connections to Hadoop and Vectorwise, along with multi-tenancy and significantly improved scaling. All of these features make Tableau more powerful and significantly more robust in large deployments. 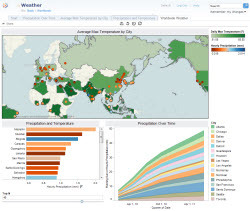 Everything that you want to know is now live at the Tableau 7.0 product page. We also have a live webinar on Thursday at 9AM PDT that you can register for here, and if you cannot attend the webinar then watch the on-demand webinar we recorded for you here. Tableau 7.0 is our biggest release to date, but it is not without your help. Huge thanks to all our beta testers, who helped us make this software high quality when it shipped. Most especially a big thanks to all our customers who generously share their insights and needs so that we can continue to innovate. We loved Tableau 7.0 so much we put together a short video to celebrate the occasion, don't forget to check it out! Is the iPad app for 7.0 on the way? I upgraded server and lost iPad compatibility. We submitted it to the iStore for approval once we had the Tableau 7.0 build, should be very soon. This has been certainly generous with people like you to give freely precisely what a number of people would have sold for an electronic book in order to make some cash for themselves, primarily given that you could possibly have tried it if you wanted.